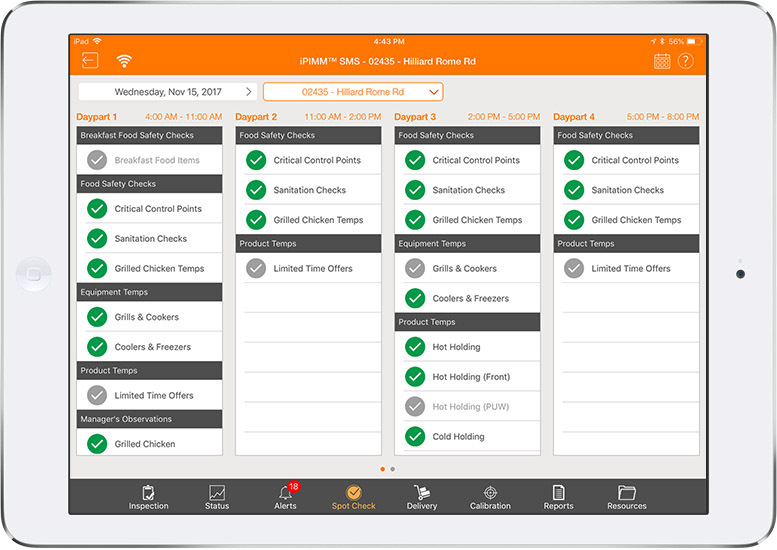 The PIMM™ Store Management System (PIMM™ SMS) provides our customers with a customized quality management solution for restaurants, convenience stores and retail grocery establishments. The system provides a user-friendly interface to enhance operational efficiencies for managing temperature, energy, drive-thru performance, and quality control 24×7. PIMM™ SMS provides a custom set of forms and reports to support an internal audit. Ghost or surprise inspections are a good way to establish ongoing compliance with corporate process and procedures. The system allows for the store manager to take “Practice Audits” with the exact audit questions at any time and as often as required. PIMM™ SMS wants to ensure that the restaurant scores an “A” rating and will be in full compliance after an official internal audit. PIMM™ SMS also provides custom operational checklist. For example, administrative checklist for “opening/closing procedures”; deposit handling; security checks; etc. The system allows for timely and compliant processes for store operations. 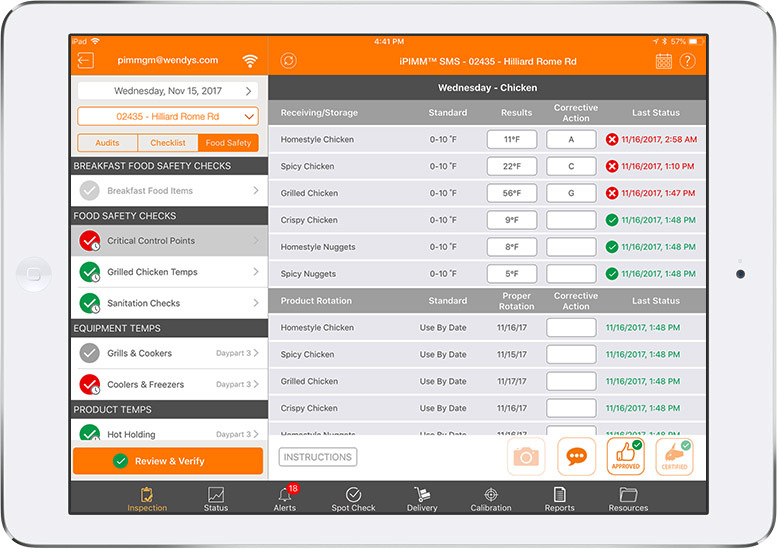 PIMM™ SMS has a built-in Food Safety Inspections and Quality Control System that simplifies data collection, scoring and reporting for daily HACCP inspections as well as weekly, monthly food safety and quality assurance processes for each restaurant facility. 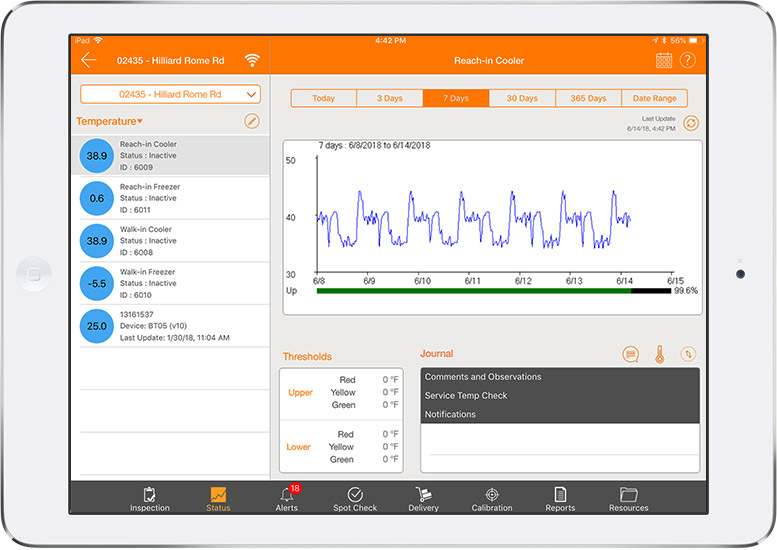 The system operates on both MS Windows and Apple iOS platforms. 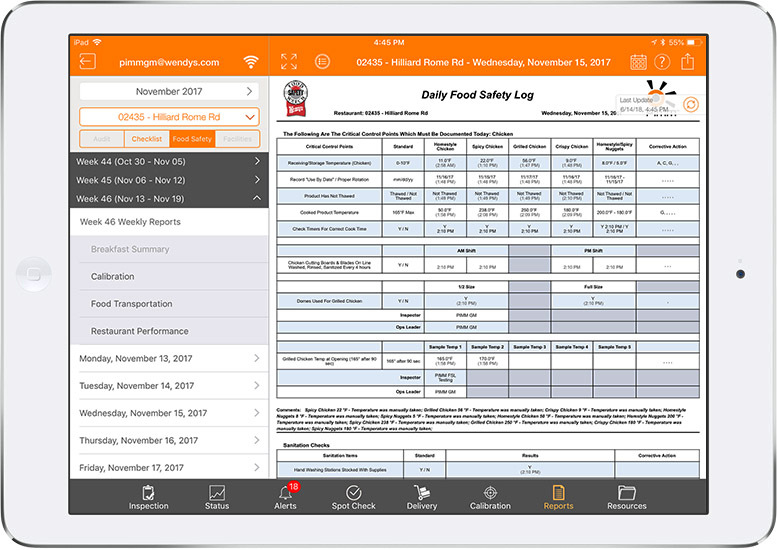 The Apple iPad mini is the perfect mobile platform for the warehouse manager – size, shape, design, durability, reliability and functionality. 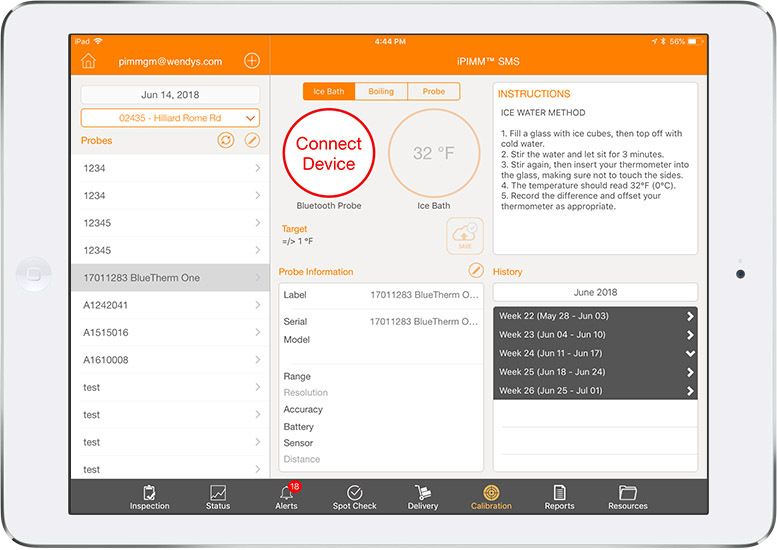 PIMM™ SMS provides centralized management of walk-in freezers/coolers, reach-in refrigeration units, thresholds, food safety inspection criteria and corrective action procedures. 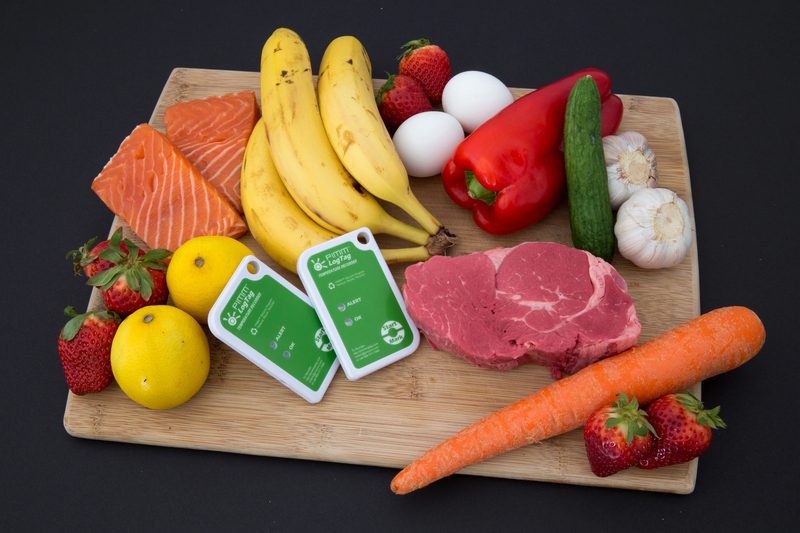 Each facility receives a “Quality Grade” that can be shared with operations staff and management to verify proper cold chain management process and procedures. Optimizing the staff responsibilities and maximizing the service to the customer is of critical importance. The PIMM™ Position Optimizer dynamically assigns staff with corresponding responsibilities based upon critical needs and priorities. The system will automatically reassign resources to key stations as the availability of staff changes throughout the day. The PIMM™ SMS Delivery module allows the store manager access to the estimated time of arrival of its distributors delivery vehicle. 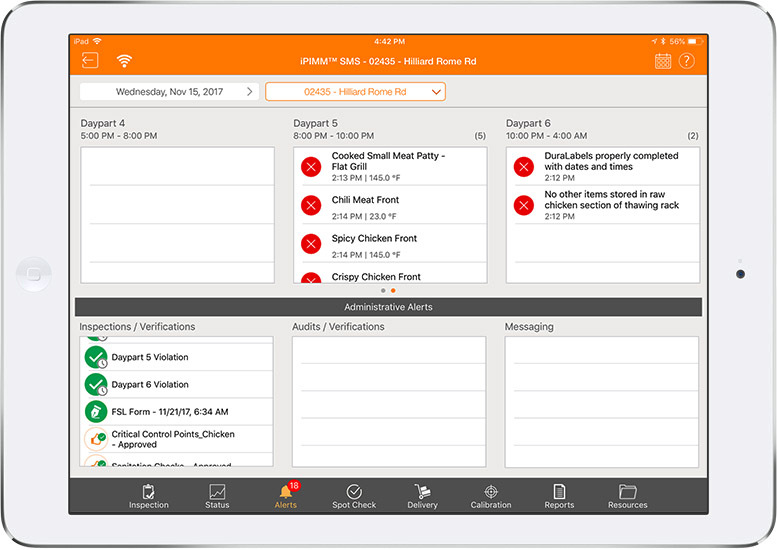 PIMM™ SMS will notify the store when delays occur, allowing the manager to adjust staffing as required. PIMM™ SMS will also provide the Proof of Delivery document confirming the details of the order(s) received from its distributor. Speed of service is critically important to the success and profitability of each restaurant. PIMM™ SMS integrates with all of the major drive-thru platforms in order to compare and contrast store to store performance. The PIMM™ Scorecard is a highly influential operational tool. The purpose of this “rating” system is to promote “A” grades. The PIMM™ Scoreboard allows each store manager with a real-time assessment of the store operations. The system is design to remind and alert users to take preventive and/or corrective actions in order to maintain effective and efficient operations. The PIMM™ SMS Survey feature allow authorized users from corporate, regional, area and/or store managers to dynamically create customized surveys that can be distributed to any/all Stores to receive real-time feedback.Survey questions can be constructed as a simple yes/no response or a selection checklist. The responses will be automatically collected, sorted and analyzed by reportin hierarchy. This feature provides invaluable feedback from the stores on a variety of operational processes, procedures and product launches. PIMM™ SMS Training System provides a series of customized Employee Quizzes. 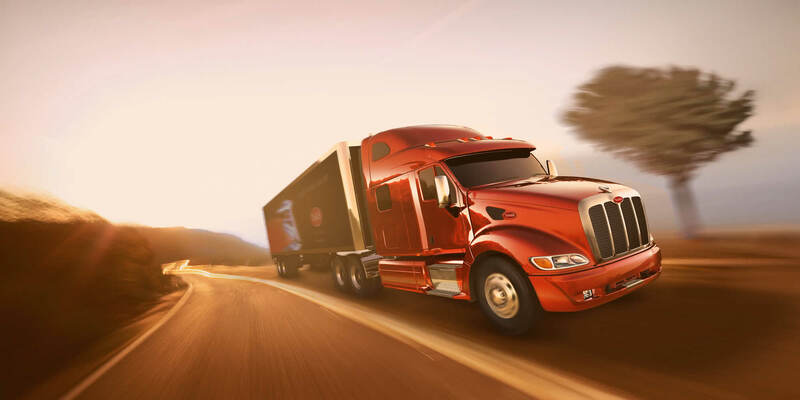 Customers can dynamically create a “Quiz” on any operational process or procedure. Having access to an easy to use training program, encourages employees to be more efficient, productive, loyal and happy. Each quiz provides the employee with immediate feedback including their score with the correct answers and associated explanations. PIMM™ SMS keeps track of all employees training participation and will send out reminders when follow-up training is recommended. While technology has previously been considered to be a luxury, today, digital tools are affordable, widespread and accessible. Technology that can help minimize labor, reduce (or eliminate) foodborne illness risks, and minimize food waste is not an expense, it’s an important investment. 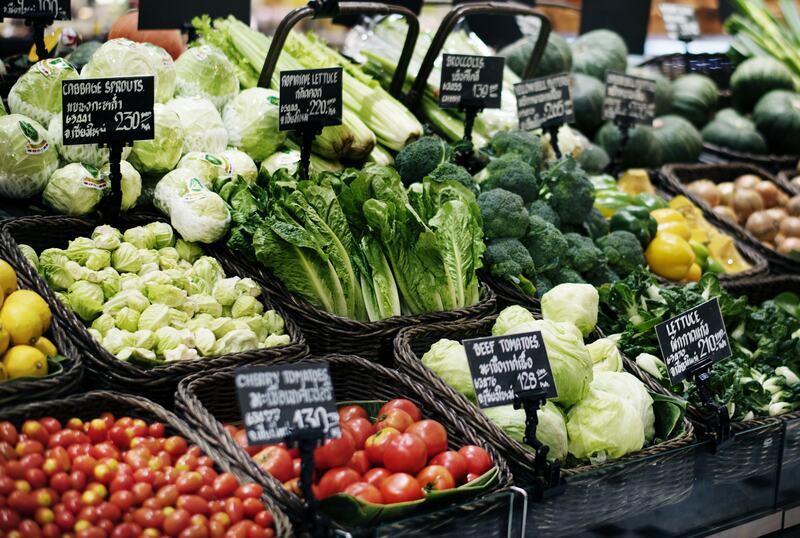 Innovative digital systems and records are fundamental to keeping foods, consumers and restaurants healthy and safe. PIMM™ is “hardware agnostic”, which means that our customers can choose any data collection hardware that meets their operational and financial requirements. In order to protect your investment, Procuro will integrate any/all installed data collection system that you may have previously purchased or are currently installed. For many of our customers, wireless offers a cost effective way to install a temperature management system. 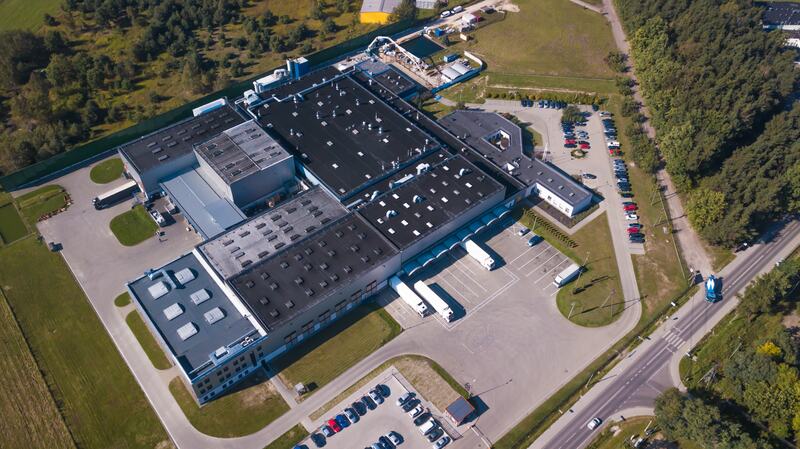 Gesytec is our recommendation for a powerful solution for cold storage facilities.